The holidays are in full swing as we approach the new year. Most of the time, this time of year means more sweet treats. If you tend to worry about your New Year’s resolutions and are already thinking that losing weight will be one of them, you can start focusing on your goal now by making healthy choices today. Choosing foods that are healthy for you will help you feel better in your body and eating healthy food can help you have a healthy smile. The holidays don’t have to drag you down, there are good tasting, healthy foods that you can pick for healthy holiday season. But Dr. Kirchmeier suggests that you be careful, there are also foods that are not good for you. Here are the best and worst holiday foods for your teeth. If you are going to, or even hosting, a holiday party you may need to bring a snack. You don’t have to bring a dessert or sweet fattening food, popcorn is a great appetizer and snack for any occasion. You can sprinkle flavors on them, some cheese on it or simply use sea salt to get a little creative. People enjoy trying different types of popcorn. Popcorn is good for your waistline as it is low in calories but skip the butter to make it low in fat. But it is not the best food for your teeth. The kernels can get stuck in between your teeth and on the gum line, if you don’t floss regularly this could cause bacteria buildup, which could lead to cavities. Brush your teeth often and floss daily if you eat popcorn. Eggnog is a popular holiday tradition but it is not the best for your oral health. It is loaded with sugar and fat, plus when you drink it, it can stay on your teeth for an extended period of time. Sugar that stays on your teeth can dig into your teeth and cause tooth decay it’s best to avoid these sweet treats during the holiday season or you can rinse out your mouth with water after each sip of egg nog. Candy canes are everywhere during the holiday season. All candy, chocolates, gum drops and candy canes are everywhere. Sweet treats are a favorite treat this time of year. But that doesn’t mean you need to eat them. It’s best to avoid them if you’re trying to slim down. Eating less sugar can help you keep a bright white smile. Candy canes are 100% sugar and the sugar that is goes into your mouth can form bacteria build up, which leads to teeth problems. In order to stay healthy this holiday season, avoid candy canes and other sweet treats that can add weight to your body and cavities to your smile. 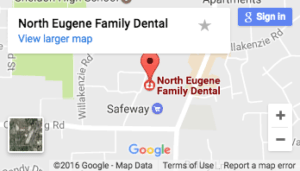 From all of us here at North Eugene Family Dental, we wish you and your loved ones a happy holiday season.